The words 'shin, gyo, so' are often used in the world of chanoyu. This comes from the three ways of writing in shodo, 'kaisho (equivalent to shin), gyosho and sosho'. Beginning with the original non-cursive shin form, this is gradually broken down into the semi-cursive gyo style and then the cursive so style. These three levels of formality were taken into the world of chanoyu as 'shin, gyo, so' (formal, semi-formal, informal). 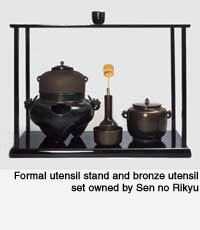 Applying this to utensils, when offering tea to a noble, such as the Ashikaga shogun, or at a shrine or temple, a matched set of bronze utensils from China (kaigu) is used with a daisu utensil stand. These are really shin (formal) utensils. In contrast to these Chinese utensils there are ceramics made in Japan that have an earthy flavour and simple utensils made of bamboo and wood that bring out the quality of their materials just as they are. These are 'so' (informal) utensils. Then there ones whose form is between these two styles, such as the Japanese ceramics that are modeled on ones made in China. These are 'gyo', or semi-formal. These distinctions of (shin, gyo, so) apply not only to ceramics but also to a lot of other utensils and to tea room architecture. Looking at these fixed categories of utensil might give us an impression of stiffness, but actually we can see in them the receptivity of the Japanese to overseas culture. The original form is broken down into a Japanese style, boldly simplified to make it a different thing from what it was originally. In this changing of the original model to an informal style does not just show the development from a Chinese utensil to a Japanese one, but from the standpoint of 'imitation (maneru), breaking down the form (kuzusu), making it informal (yatsusu)' we can see that 'shin, gyo, so' is the Japanese people's way of absorbing culture, which makes it deeply interesting.